When one sees the hand of a legendary figure like Nelson Mandela, one expects his hand to be a certain way. Knowing him to be a humanitarian, a great leader, and someone who stood steadfast during his years of incarceration by the apartheid government of South Africa, I was sure I would find a large thumb, broad hand, deep lines and a developed Upper Mars. I did find these signs, but I found more, some of which was a little surprising. his left passive hand. (A link to a photo of right active hand here and for the left passive check here). This indicates that Mandela was born with a good intellect and concentration although his heart was always a little stronger than the head. As he grew older however the tendency of the heart to lead was enhanced. His emotions and feelings dominated his persona. The developed mounts, strong Heartline and the shape of his fingers clearly point to someone who is emotional and allows his heart to take decisions. These signs point to a slight imbalance of personality and can lead to wrong decision-making and that would be the case for most people. However, Nelson Mandela has multiple signs on his hand (strongly marked) revealing him to be a very large-hearted, compassionate and righteous (from the thumb, mount of Venus, Jupiter finger, Heartline) without a shred of materialism. Plus, his broad and unselfish outlook on life (shape of hand, Headline) shows his understanding of issues without thinking of narrow interests. Mandela’s Jupiter finger and Mount tells us that he is a man with a cause. The qualities of high-mindedness, honour and idealism are present. When combined with his heart qualities, it can mean that such people are willing to die for a cause. They are often martyrs. They will not compromise their ideals. Nelson Mandela's hand shows humility and this too sets him apart from others. He can be idealistic and righteous without being arrogant, and this points to superior leadership qualities (confirmed by his thumb). The quality of righteousness (in the hands of some other famous people which I have seen) is usually accompanied with some level of arrogance, but this is not the case with Mandela. Righteousness exists without hypocrisy, and without ego. Another unusual characteristic is that his hand does not show him to be controlling or manipulative in any way. Again, a rare quality in a leader. If his ideals made him spend 27 years in prison and it was Mandela's mental strength and stubbornness which enabled him to survive. Perhaps it was his prison experience which changed him, made him into a more emotional man, a man who relied on his heart and soul to show him the way. A trait of his which could make him a difficult man to live with would be his tendency to be frank, almost brutally frank and direct. That, and the fact that it was the heart which dictated. Overall, the hand of Nelson Mandela is the hand of an unusual human being. His idealism could have thrown any other off balance, but these qualities have done him and others a great good. (Nelson Mandela is first elected South African president. Earlier, he was an anti-apartheid activist). Related Reading: Hand Readings of other African leaders: Muammar Gaddafi Hand Reading or Idi Amin's hand reveals his lack of reasoning powers or Jacob Zuma's hand analysis or read about the Heads of State of different countries around the world. often find that the sun sign description match the palm readings.cancerian mandela as emotional,taurean sachin as humble,scorpion bill gates as clever and charitable-describe their individual sun signs with slight variations. sunsigns have a say in palmistry too? Anonymous, a lot of people who are not "cancerians" are very emotional. Also "Taureans"are not necessarily humble, in fact Nelson Mandela's hand shows a lot of humility, more than that of Sachin's. Also one of the most humble people whose hands I have read is Anna Hazare, and he is not a Taurean! Also a lot of clever and charitable people are from all sun signs. What I am trying to say is that the qualities of being emotional, clever, humble, or charitable are almost equally distributed amongst all sun signs. 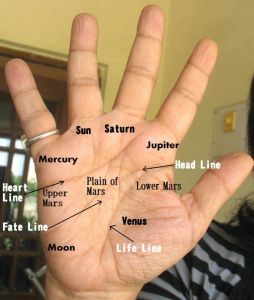 Sun signs or astrology has absolutely nothing to do with Palmistry or Hand Reading. In fact, I personally think sun signs or moon signs are rubbish. In today's world of selfish pursuits, I wish the world had more people like this. Period. Every auspicious occasion is begun after looking at the astrological aspects of the day and people involved. Some of the mundane astrological stuff I find funny too. People tend to rely on it on a daily basis which is never a positive thing. I do know that some astrologers indulge in some pretty intense mathematical calculations to arrive at conclusions about people and their lives. I'm sure you have tried to understand more about it, so I ask this. Is there no possibility of astrology being a reliable method of understanding human nature, to forsee the future, given that it is called an ancient science and all? Sneha, you have asked me a difficult question. True, I can say with confidence that sun signs and moon signs are rubbish, because I firmly believe they are. They reflect a simplistic and immature aspect of Astrology. When it comes to actual Astrology, I cannot condemn it unequivocally. However I do not believe we have a fixed future so therefore if any Astrologer claims to tell the exact future I certainly think he is a fraud and the kind of Astrology he practices a fraud. When it comes to understanding human nature via Astrology I find it difficult to understand how two people born at the exact same place at the same time (as it happens in hospitals) can have the same nature. It is impossible. Our nature is dependent on our genes and the environment and our future depends on how our nature interacts with the environment. Therefore I cannot see how Astrology can be true. Replying to the above - If our nature is dependent on our genes and environment, then how can the shape of a hand or the lines predict the qualities in a person? How is that a person with a thick thumb and broad hand always having a certain quality? Don't you think that these features depend more on body physiology (and perhaps genes) than any generalization of human character? And what do you think about good time/ bad time predictions of astrology? DI, the hand and lines are part of the body and the maximum nerves connect the hand to the brain. It is really quite logical. Our brain decides our personality, not the stars or the moon. And in any case the sign you mentioned, like thick thumb does not necessarily mean a particular quality. That is what I keep saying. Human beings are complex and these traits are often contradicted by others. One has to read the importance of each sign. And about the good and bad times of Astrology, as I mentioned in the above comment, I cannot condemn the whole of Astrology because I genuinely do not know. Also, it is important to respect other people's beliefs. I do not believe in Astrology and I think I am entitled to my opinion, just like I respect the opinion of anyone who does not believe in Palmistry! Hi Nita, I was waiting for you to read Mr. Mandelas hands, appreciate it. But you dint mention anything about his thumb. Mr. Curious, Nelson Mandela has a large thumb and it shows his leadership qualities as well as will power and determination. I did mention it in the first paragraph. If there is anything specific you want to know? I have myself come across a couple of astrologers who have predicted things quite accurately, atleast for me! There is this jathakam (i think its called panchang in the North) and they use that to predict things. That's why we are not able to disbelieve in astrology. BTW what do you think about Signature analysis? Is that science? I know what you mean. I do believe that Astrological predictions come true about 50% of the time. That is my experience with people around me (not me personally). About handwriting analysis, I do believe it is a science. I'm sorry to say this, but your analyses of the personalities here are from hindsight and seemed like fitting the evidence to the outcome. Justin, I am sorry that you feel this way. Yes I do look for evidence that will confirm a personality trait and I do not see anything wrong in it. Let me assure you it is quite impossible to keep apart what I know about the person when I write, unless I stop reading and absorbing the world around me. I do tend to look for signs confirming a known personality trait of a famous person. If the signs are not present, either I say so (if it is a well known trait) or I do not mention it at all. There are various well known traits of famous people which I have clearly said do not exist and that is also interesting because you can find out if the celeb is a fake. In fact I find that doing this is fascinating. But then all of the reading is not about this. More often than not, I also see things which are not known, some underlying trait that is a surprise to me. Overall though I should be flattered by your comment because it means that my hand reading is brilliant.